Half of the Sweet 16 is now decided. We cashed yesterday going 3-1 with Marquette, Arizona, and Wichita State. Let’s hope we keep it going with today’s picks! Oregon: The Ducks have been extremely impressive in the first two rounds of the tournament, eager to show the selection committee they made a mistake giving them a 12th seed. They were dominant in both wins a 68-55 win over No. 5 Oklahoma State and a 74-57 win over No. 5 Saint Louis. However, they turned the ball over 36 times in each of their first two games. Louisville: The Cardinals have rattled off 12 consecutive wins and are playing their best basketball of the year at the right time. Neither of Louisville’s games have even been close. They routed No. 16 N.C. A&T and No. 8 Colorado State in the first two games of the tournament. Our Pick: Louisville has been the most dominant team in this tournament and are not only out to just win the game, but instead are trying to crush opponents by half-time. Their stifling defense will do the Ducks no favors. Oregon has had serious problems with turning the ball over (more than any other team still left in the tournament by a large margin) and should be forced into more poor decisions today against Louisville. -10.5 is a lot of points, but Louisville has not faced a team that could match their defense and athleticism yet in the tournament. 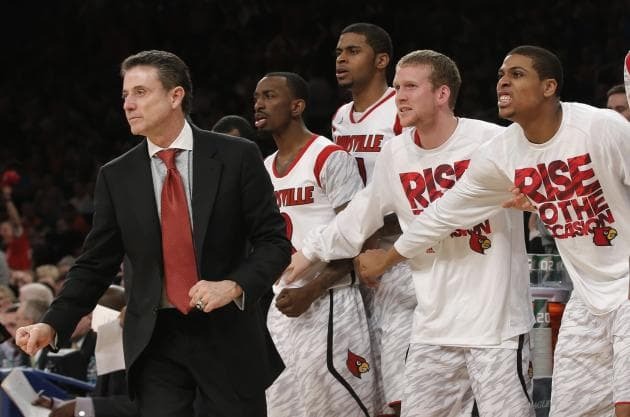 We like the Louisville Cardinals -10.5. Michigan: The Wolverines make their first Sweet 16 appearance since 1994 when they take on Kansas on Friday in Arlington. Michigan took out No. 13 South Dakota State in their first game of the tournament and routed Virginia Commonwealth in their second game 78-53. Kansas: The Jayhawks had a little trouble in their opening game against No. 16 Western Kentucky but pulled away in the final minutes to win 64-57. They then dispatched No. 8 North Carolina, 70-58 to advance to the Sweet 16. Our Pick: This should be one of the hardest fought contests of the day and we’re guessing this one is decided in the final minutes. KU is the more athletic team of the two, and it is worrisome that Michigan has no true center. However, we feel like this is the moment Michigan has been waiting for all tournament. With Ben McLemore struggling so far in the tournament and the Jayhawks clearly not playing their best basketball as of late, we like Michigan to pull the upset. Bet the Michigan Wolverines +2. Michigan State: The Spartans advance to the Sweet 16 with relative ease. They dominated their Round of 64 game against Valparaiso, winning 65-54 and followed that up with a beat down of Memphis, 70-48. Duke: The Blue Devils have been playing well since the start of the tournament, but they still have not played anyone that has truly tested them. They handled Creighton last Saturday, winning 66-50 despite shooting a season low 38.8 percent. Their round of 64 was a relative route of Albany with Duke winning, 73-61. Our Pick: Like many ACC teams, Duke is talented from top to bottom but other than Mason Plumlee – the Blue Devils are soft. Duke is so reliant on their three point and mid-range shooting game to win basketball games – it’s hard to trust them. Michigan’s State tough defense has done in many teams throughout the season and in the tournament, and we think that happens again on Friday to the Blue Devils. We like the Michigan State Spartans +2.5. Florida Gulf Coast: The only 15th seed to ever make to the Sweet 16, FGCU has captivated the nation and is this year’s true Cinderella. They blew out No. 2 Georgetown and smacked around No. 7 San Diego State to reach this stage of the tournament. Their speedy and efficient backcourt play of Brett Comer and Sherwood Brown has propelled the Eagles to be a part of NCAA Tournament History. Florida: While FGCU has been making headlines the Gators have quietly been flying under the radar with two decisive victories so far in the tournament. Florida crushed Northwestern State 79-47, and easily dispatched Minnesota 78-64 to book their ticket to the Sweet 16. Our Pick: As impressive as Florida Gulf Coast has been in the tournament, this will likely be the game the Cinderella dream ends. Florida can play the best defense in the nation when they are in true lockdown mode, and we think Billy Donovan has his squad ready to do just that. There is no more underestimating the FCGU Eagles and the Gators know this. Florida could be the best team left in this tournament that no one is talking about. Despite the big -13 number, we like the Gators to get it done. Bet the Florida Gators -13.